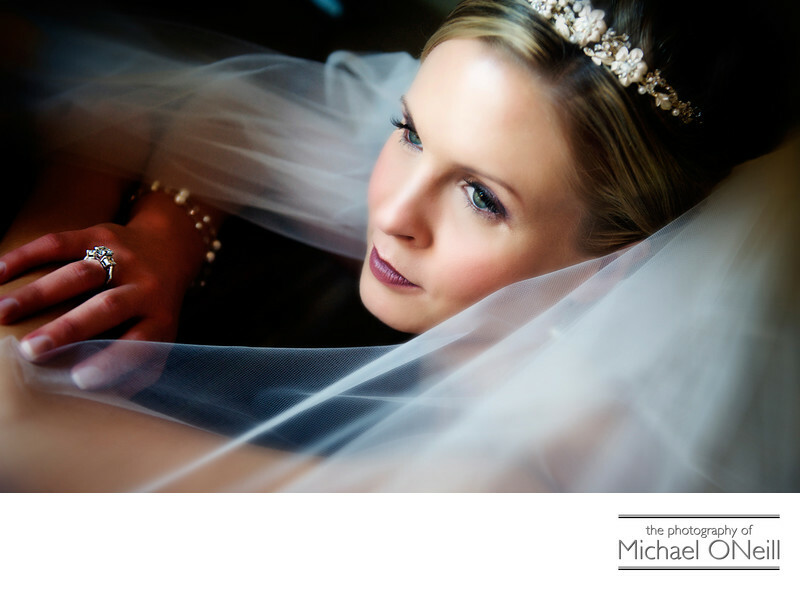 This beautiful available light bridal portrait was taken next to a window in the bride’s fabulous wedding reception venue, The Glen Cove Mansion in Glen Cove, NY. I absolutely love working at any of the mansions on the Long Island Gold Coast including The deSeversky Mansion, The Royalton Mansion at Roslyn Country Club and Oheka Castle in Huntington, New York. All of these venues offer truly elegant surroundings and first class catering services. All have beautiful architecture and sprawling grounds for dynamic wedding photographs. I love working with the natural window light that illuminates glamorous portraits of this style. The soft light enhances a bride’s complexion and offers a soft glow to her bridal veil. This shot was taken shortly before the reveal...where the groom would see his bride in her wedding dress for the first time. Some intimate formal portraits of the bride and groom would follow along with some modern, playful, fun pictures of the weeding party...the best man, maid of honor, bridesmaids, groomsmen, flower girls and ring bearer. Whether you’re from Long Island, New York City (NYC) or traveling onto Long Island for a romantic destination wedding at one of these fine establishments, give me a call. I would love to be a part of your big day as the photographer entrusted with preserving your memories for a lifetime of enjoyment.